American War Heroes is a 501 (c) 3 non-profit organization consisting of business leaders, professional athletes, entertainers, corporations, individual donors and American War Hero Members dedicated to providing Emotional, Career, and especially Financial Support to our American Military Personnel who have been injured fighting the war on terrorism. Visit their site and consider contributing to this worthy organization. Visit the Military Resource Directory. Lots of information about Military, Law Enforcement, Gov't Resources and Research. 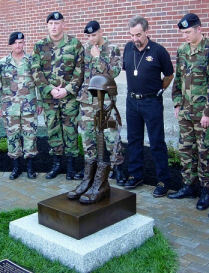 Bronze Military Statues, children and animals. Visit this site even if it's just to look at their beautiful work. Military Dog Tags....Identification you and your pets can wear. Write to a combat soldier. Operation, Mail Our Troops! Yes, you can mail our troops. Send care packages and help the wounded soldiers that keep us free! Go to this site, please. Cuban Mahogany, Narra, Ukall, Alexandria Laurel, B'Kau and many others. Free Military Veteran replacement medals: Just go to this site, fill out some information and mail it in. These nice folks can help. To bring out the real beauty of your wood, for any project. Great Collectibles Deserve Our Great Display Cases. Check out our collection of American flags, car flags, garden flags, stick flags, flagpoles, and custom flags made to order. Custom Flags - Custom flags are our specialty! We can design and create your custom flags or banners at affordable prices. Northwest Timber specializes in highly-figured hardwood lumber, such as Quilted Maple, Figured Walnut, and Oregon Myrtlewood. Flags : A full collection of cotton, nylon, polyester, sewn polyester and super knit polyester flags and banners to show your patriotism. "Building Better Lives for America's Disabled Veterans"
Shadow Boxes and Wooden miniatures by MaxisMinis. Shadow Boxes and Wooden miniatures hand crafted by Maxis Miniatures. Offering you a wide array of information about military colleges and schools, military safety and military knowledge.